New York taxpayers will shell out $61,000 for each of the 25,000 jobs to be created over the next 15 years from Amazon’s new split-model HQ2 plan. This works out to nearly double the $32,000 in tax incentives that Virginia residents will shoulder for the same number of jobs, according to Bloomberg. Not everyone is happy with New York’s current plan to offer performance-based direct incentives of $1.525 billion and a cash grant of $325 million based on the square footage of buildings Amazon occupies over the next 10 years. The homelessness crisis in the United States is getting a lot worse, and it is happening at a pace that is absolutely frightening. 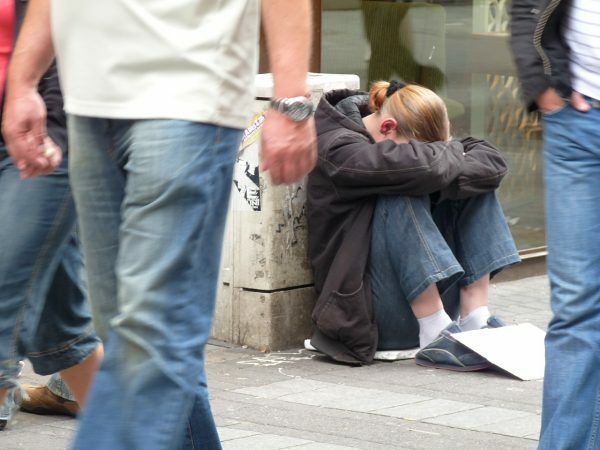 Did you realize that more than half a million Americans are homeless right now? One out of every four homeless Americans actually has a job, but thanks to rapidly rising housing prices they are not able to afford a place to live. So every night in this country, hundreds of thousands of people are sleeping in shelters, in their vehicles or on the streets. It is a national crisis that isn’t going away, and during the next economic downturn it is only going to intensify. Over the past decade, more than 3.5 million Americans have left high-tax blue states like California, New York, and many others in the Northeast, for low-tax red states like Arizona, Florida, and Texas. 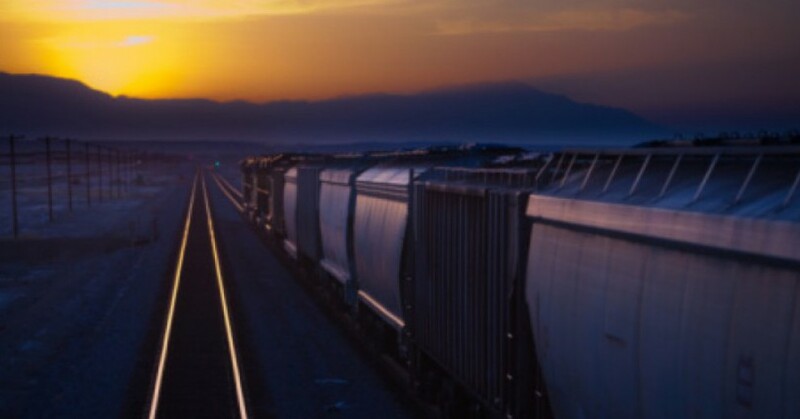 While the migration has been happening for years, conservative economists Arthur Laffer and Stephen Moore are forecasting the next significant movement out of blue states could be right around the corner. Earlier this week, in an op-ed in the Wall Street Journal titled “So Long, California. Sayonara, New York,” Laffer and Moore spoke about a provision within the brand-new tax bill that could create a mass migration of roughly 800,000 people – fleeing their estates in California and New York for better days in low-tax states over the next three or so years. “High earners in places with hefty income taxes – not just California and New York, but also Minnesota and New Jersey – will bear more of the true cost of their state government. 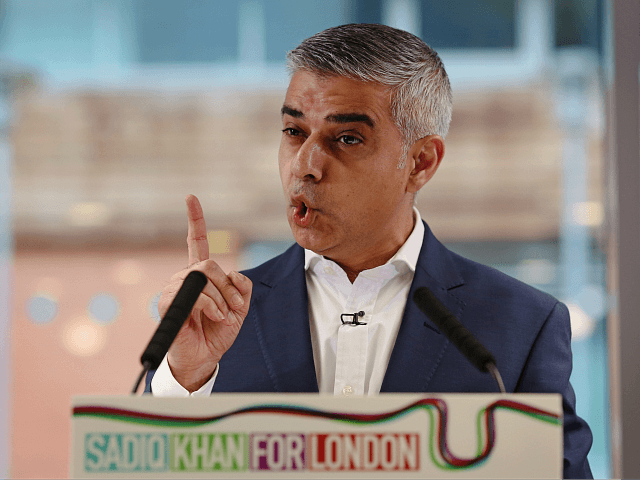 London has overtaken New York City for number of murders for the first time in over 200 years under the mayoralty of Labour’s Sadiq Khan. Britain’s multicultural capital edged ahead of the American city — once so notorious for its high crime rates that it was chosen as the setting for Charles Bronson’s Death Wish –– in February, The Times reports. London saw 15 killings to New York’s 14 over the course of the month, and appears to have outstripped ‘Gotham’ yet again in March, with 22 killings to 21. Historically, London has had a murder rate per person between half and one-twentieth of New York’s since 1800, according to FBI data and studies by University of California researcher Eric Monkkonen. Figures released last year showed London was already the more dangerous of the two cities for almost every other category of violent and sexual crime, with Londoners six times more likely to be burgled than New Yorkers, three times more likely to be raped, and one and a half times more likely to be robbed. The numbers fly in the face of Mayor Khan’s claim that London is “the safest global city in the world, and one of the safest cities in the world” in 2017. This assertion already appeared highly questionable after a spate of radical Islamic terror attacks and an admission that hundreds of Islamic State volunteers have returned to the capital and are not being monitored, alongside disturbing developments such as the city being crowned “acid attack capital of the world” following an epidemic of assaults using corrosive substances. Where the heck is the Foreign Money when you need it? The market for office buildings in one of the hottest and most overheated real-estate markets in the world, New York City, just went into the deep-freeze. If you see the word “plunge” a lot below, it’s because that’s what happened in the first quarter of 2017. It was exactly what no one in the industry needed. 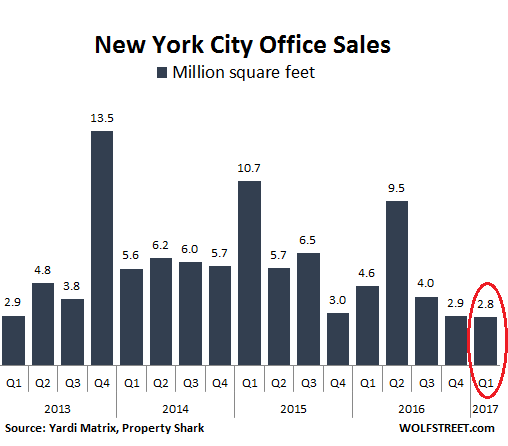 Sales of large office properties (those with over 50,000 square feet) that closed in Q1 2017 plunged 63% year-over-year, from $5.54 billion in Q1 2016 to $2.1 billion. It was the lowest transaction amount in any quarter since Q1 2013. 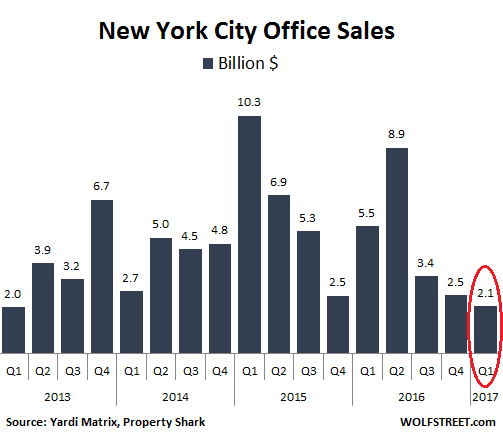 According to Commercial Café, which analyzed data from Yardi Matrix and PropertyShark, that $2.1 billion in Q1 office sales, in total 10 deals, was down an ear-ringing 80% from the $10.3 billion, and 26 deals in Q1 2015. The average price per square foot of these sales plunged 23% year-over-year, to $741 per square foot, and 36% from the peak, which occurred in Q2 2015. It was the lowest average since Q1 2014. It was an ugly quarter. In Lower Manhattan, 31 towers with over 5,000 apartments are sprouting up. They’re not exactly in the “affordable” category. The median price for condos – half sell for more, half sell for less – has soared 77% since 2013, to $2.43 million, while the median price in the overall Manhattan condo market has shot up “only” 54% to $1.84 million. These are stunning numbers, even for those of us who’ve become inured to stunning numbers by being exposed on a daily basis to the craziness in San Francisco. At 30 Park Place, an 82-story tower a few blocks from Calatrava’s new station, a new duplex apartment with more than 6,000 sq ft of living space is listed at $32.5 million through Corcoran Group Real Estate. A few doors down, Soho Properties is developing 45 Park Place, a 70-story condo project, with the cheapest apartments expected to sell for $9 million. Don’t even ask about the association fees. Soaring condo prices induce developers to build more, and they gravitate toward the top end. Why? Because that’s where the money is. Cheap credit funds their ambitions. It takes years to take a condo tower from planning to completion. Once the process is far enough advanced, it’s difficult and costly to stop it. And these towers keep growing and adding new supply, long after demand has started sagging. That’s why condo gluts are so terrible – particularly for lenders. In Chelsea, the asking price for a 5,995 sq ft penthouse in Walker Tower, a refurbished art deco project, fell from $70 million to $55 million in the 10 months to March, according to StreetEasy. In SoHo, a 5,912 sq ft penthouse with a private rooftop deck has been on sale for almost nine months and the price has been reduced from $26.5 million to $22.5 million. Suddenly, Manhattan is awash with lavish penthouses, each with so-called “spectacular views” and “one-of-a-kind amenities.” According to Trulia, the property listings site, more than 700 apartments priced in excess of $10 million are on the market in the borough. The reality is that sellers have been forced to discount and deal on the most expensive units.